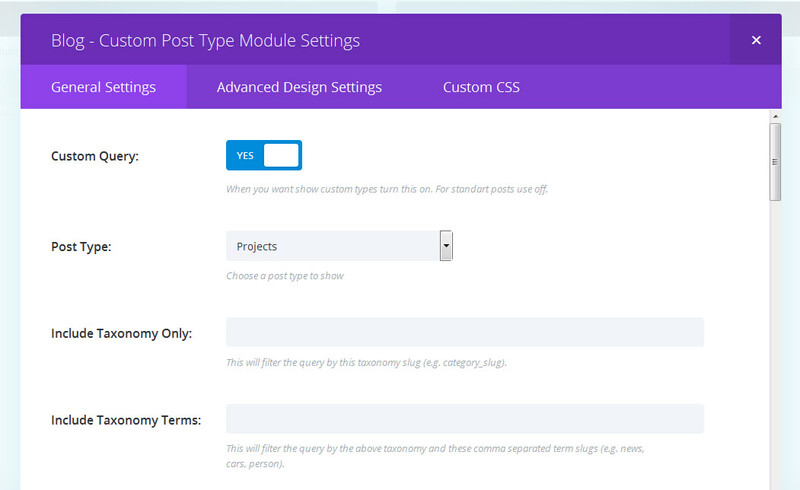 Notice: Our modules (plugins) support latest DIVI theme or builder and Wordpress. 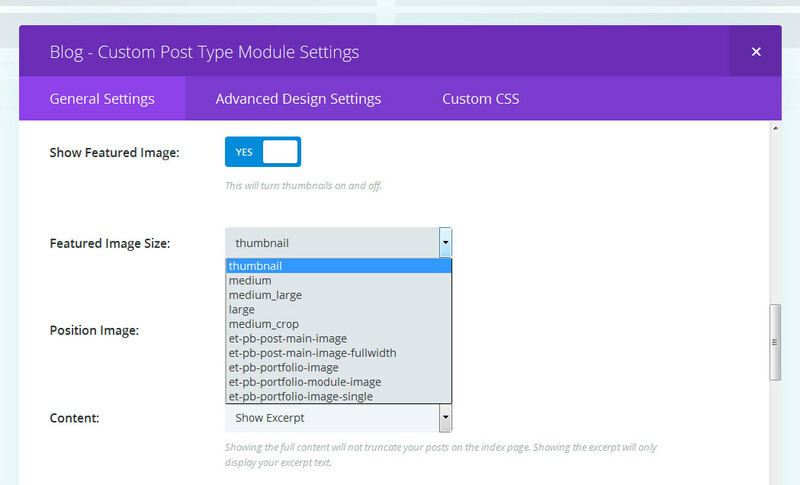 Currently, the module correctly can only be edited in the DIVI Builder backend and the WP Classic Editor. 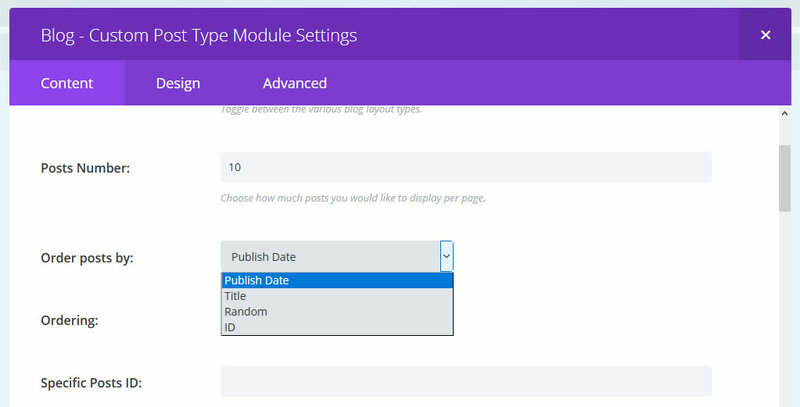 Please also read thist post: Divi And WordPress 5.0 part "You Can Still Use The Classic Divi Builder By Installing The Classic Editor Plugin"
1. To install Blog – Custom Post Type, simply login to your WordPress site and go to Plugins > Add New > Upload Plugin and locate your .zip and upload. Note: This plugin requires the Divi or Extra Theme by Elegant Themes, which must be purchased separately. You are free to use this plugin for both personal and commercial use on as many your sites as you wish. 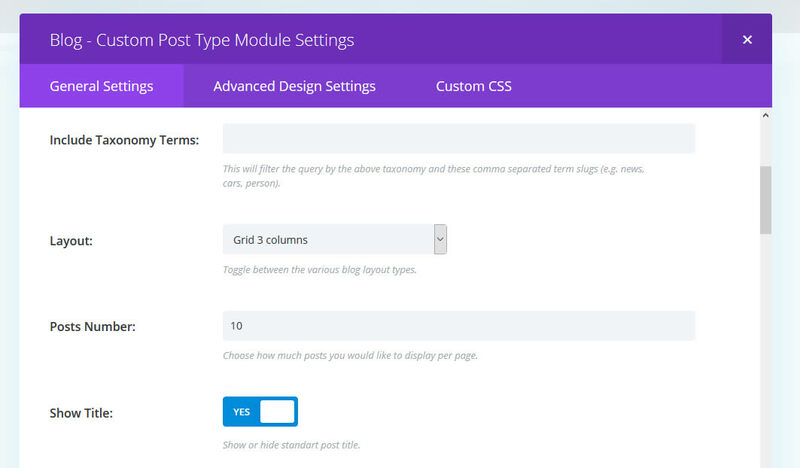 Custom Post Type Grid Blog is compatible with DIVI theme and easy to find in administration. 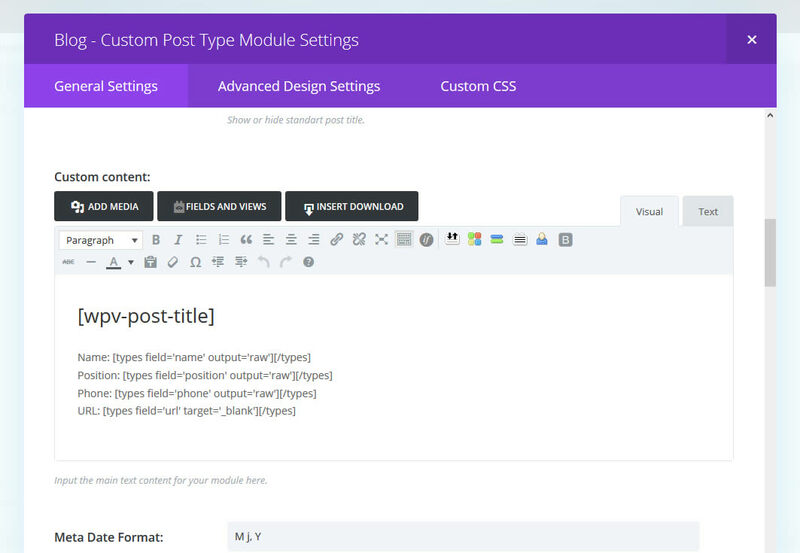 Note: At the moment, unfortunately, the DIVI Visual Builder frontend does not support editing external modules. The module can only be fully edited in the backend administration. 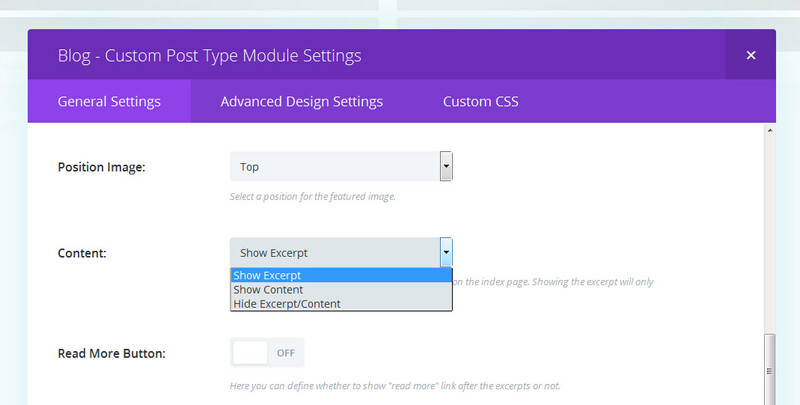 The module is only viewable and can be manipulated in Frontend Visual Builder (cannot be added or edited). 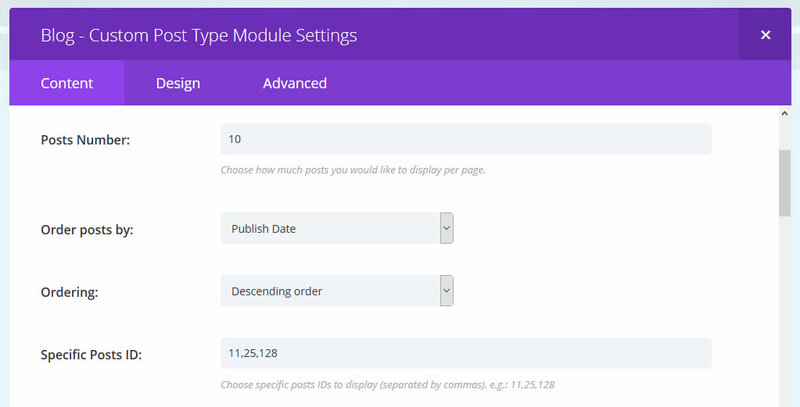 Custom Post Type Grid Blog allows you to set view of standard posts or custom post types. It is easy to set view layouts – fullwidth, 2 columns, 3 columns, 4 columns, 5 columns or 6 columns. Show or hide standart custom post title. It is very useful if you are using Custom content. You can sort of displayed posts by date, title, id and random. Option to view selected posts by their IDs only. 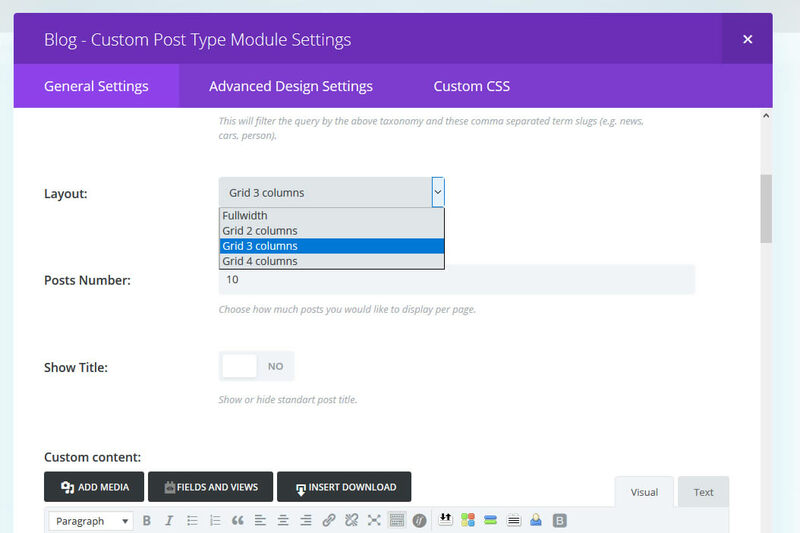 Custom Content field allows you to insert any html content inlcuding shortcodes for work with custom fields and custom post types. Great working with Toolset Plugin. Example you can see in demo. You can choose from several sizes of featured image. It is possible to set three different types of featured image position – right, left or top. You can also hide or show excerpt and content.